EXPLORER 727 is a high-speed, vehicular broadband terminal. 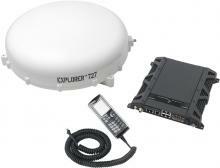 It consists of three fully integrated units – a transceiver, an IP handset and a roof mountable antenna. Whether you’re engaged in defense, humanitarian operations, live radio or TV broadcasts or telemedicine, you need rapidly deployable communication equipment you can always rely on. Place the antenna on the roof of your vehicle to turn it into a complete mobile communication hub, the Explorer 727 provides access to the internet and phone networks instantly. Constantly tracking satellite positions and making high-speed connectivity and communication possible – even at speeds in excess of 200 km/h the Explorer 727 facilitates both live streaming and store-and-forward utlising the highest streaming rates available on BGAN with BGAN X-Stream when the terminal is standing still.